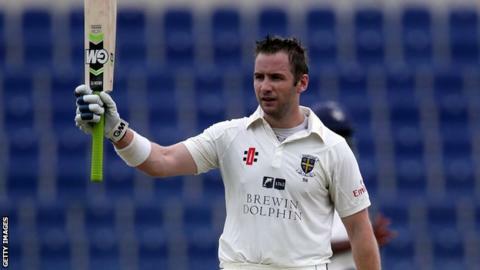 Durham batsman Mark Stoneman says being named the club's limited-overs captain means a lot to him as a north east boy. The 26-year-old will take charge in the T20 Blast and One-Day Cup competitions. In a leadership overhaul at Chester-le-Street, club captain Dale Benkenstein has left, with Collingwood, who led them to the title last year after Benkenstein was injured, and Stoneman assuming his role. Additionally, Jon Lewis has taken over first-team coaching duties, with director of cricket Geoff Cook taking on a youth development role. Stoneman told BBC Look North: "To come up through the academy and go on to be captain in any format is a huge honour. My family and I are very proud." This winter, the Newcastle-born opener to last until the end of 2016, a reward for a very successful season last year. Stoneman scored three first-class centuries to help Durham and amassed 1,011 runs across all formats. He began this season in similar vein, in the county season curtain-raiser against the MCC in Abu Dhabi. "Last year was the first time I've got over 1,000 runs," he added. "I see it as a real benchmark now. It has to be my target year in, year out."